In the past several months, the Prineville – Crook County Chamber has been investing in our community. We have spearheaded activities that monetarily benefitted the local FFA, the Community Baby Shower, the Holiday Partnership and Crook County 4-H Archery. All of the fundraisers required no money from the Chamber budget, but were able to raise funds with a little time, some volunteer help and getting the word out. One of our fundraising ideas came from another chamber in the state that holds 50/50 raffles at every Friday business event. They allow different organizations and nonprofits to put their name in a drawing to determine who will be the recipient of raised funds. Over the course of several weeks, the Prineville – Crook County Chamber Ambassadors promoted the 50/50 raffle at our Friday morning Chamber Perks and each week. Their efforts help raise money to give to organizations within our local community. To date, they have collected money to benefit the Community Baby Shower, Holiday Partnership and Crook County 4-H Archery. In October, the Chamber started promoting the Candy Crawl and encouraged our local businesses to "dress up" their storefronts for the holiday. Our staff came up with the idea to get corn stalks from the local land lab, which were donated to us for free. Our job was to do the manual labor of cutting, hauling and bunching them. It took about less than 10 volunteers and one hour to cut down three very full truck beds of corn stalks. We recruited students needing community service hours to bunch the stalks and strip them of any remaining viable ears of corn still attached. Our staff then donated more than 100 ears of corn to the local food bank, and another large bunch to Rimrock Trails kitchen. Local businesses then purchased the dried and bunched corn stalks (which we learned were also referred to as "fodder shocks") for their Halloween décor. When it was all said and done, our staff was only out a few hours, but we supplied food to our community and raised money for FFA. Our latest giving back campaign was the creation of the Charm Trail in Prineville. Designated merchants in town had bracelets and charms for sale that represented their business. 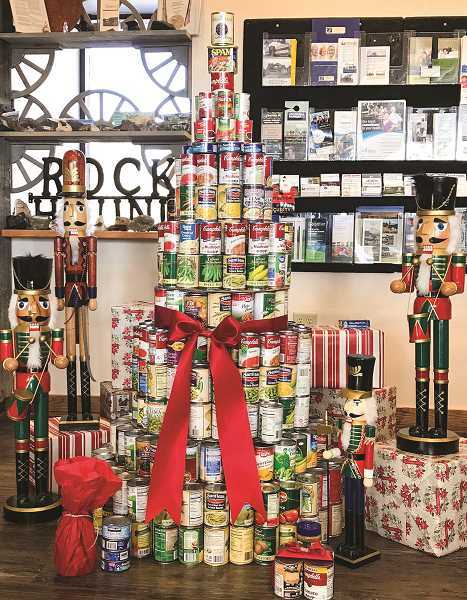 For the month of November, a shopper could get one charm for one can of canned food. The campaign went better than planned with most of the involved businesses going through more than 100 charms in less than a months' time. And the amount of donated food has been overwhelming. All food will be given to the Holiday Partnership to support families with children, senior and disabled citizens in Crook County in need of food baskets. One of my many goals being part of the Prineville – Crook County Chamber, is to partner with our non-profit entities and members to look for ways to GIVE BACK to our community. It doesn't always take deep pockets, but sometimes just a bit of creativity and some extra time. I'd also like to pass this sense of giving back on to our members and businesses. Giving back and volunteering in your community is a rewarding experience and has the potential to have a huge impact on a lot of people. Choose a cause, charity or nonprofit that you believe in and make Prineville and Crook County a better place to live. It's good for business.